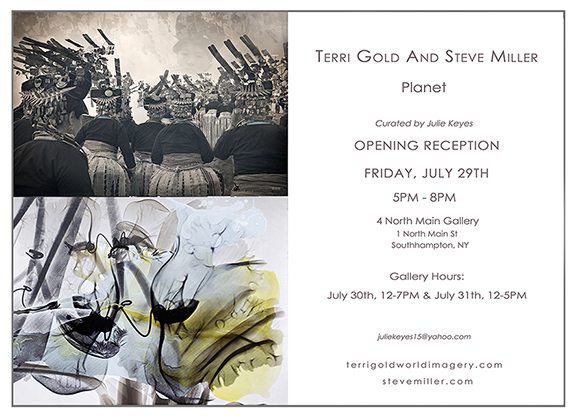 Julie Keyes presents the exhibition “Planet” at 4 North Main Gallery opening Friday, July 29th from 5 PM to 8PM. In the exhibition, “Planet”, Keyes curates a visual conversation between photographer Terri Gold and painter Steve Miller. Planet: Populations migrate and indigenous cultures disappear. The competition for natural resources depletes our biodiversity while science proves the earth is warming. We live in a planet under stress where Terri Gold captures the last moments of fading cultures. At risk is a vast archive of knowledge and expertise of healers and weavers, poets and saints. Steve Miller uses medical technology to give the planet a check-up. If the Amazon rain forests are the lungs of the planet, then Miller x-rays these lungs to look inside the patient, Earth. Terri Gold’s lifelong body of work “Still Points in a Turning World “focuses on Asia’s vanishing tribal heritage and has been widely published and exhibited. Recently, she was featured in aCurator Magazine and Lenscratch and was a winner in the Planet Magazine and London International Creative Competitions. Gold’s work is interpretive in nature and incorporates the use of infrared light and the invisible light spectrum. She is interested in the myriad ways in which people find meaning in their lives, how an individual explores his or her existence through their traditions. This current series, entitled “Into the Mists of Time “ is about life in Guizhou, China. Over the past 25 years, Steve Miller has presented 33 solo exhibitions at institutions in the United States, China, France, and Germany. His exhibitions have been reviewed in Le Monde, Süddeutsche Zeitung, The New York Times, The Boston Globe, ArtForum, ARTnews, and Art in America. Miller was one of the first artists to experiment with computers in the early 1980’s, and his work today continues to integrate science and technology with fine art. Using the lens of technology Miller reinvents at the traditional painted portrait, the world of fashion, particle physics, molecular biology and the world environmental crisis. His current project, entitled “Health of the Planet,” is about the rainforest in Brazil. 4 North Main Gallery is located at 1 North Main Street in Southampton, New York. Gallery hours: July 30th, 12 – 7PM and July 31st, 12-5PM. This entry was posted in China, digital Infrared, Events, Gallery Shows, Infrared Imagery and tagged 4 north main gallery, China, digital infrared photography, Guizhou, Steve Miller, Terri Gold. Bookmark the permalink.